Randy and Brian Fox, Newell, SD, Mrnak Hereford bull buyers. Levin Ranch, Hereford S.D., purchased a couple Mrnak bulls and one of the Acord QH ranch horses. 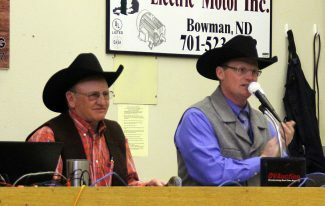 Wayne Mrnak and Scott Weishaar at the start of the Mrnak Hereford sale. The Mrnak family brought another great set of 2 year old Hereford bulls to town for their 52nd Annual Production sale. 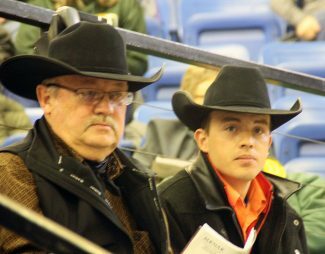 The heifers offered were from Mrnaks, and several Mrnak bull buyers, all either sired by or bred to Mrnak bulls. This was a very solid set of both bulls and heifers, presented by a family with roots extremely deep in both Hereford cattle and southwestern North Dakota. Topping the bulls was lot 15, MH 4119 Advance 746, a 3/17 son of MH 2239 Advance 4119 selling to repeat buyer, Scott Katus, Watauga, S.D., for $18,000. Katus also got lot 23, MH 2239 Advance 789, a 4/17 son of H5 9075 Advance 2239 at $11,000. Lot 61, MH Frontier 7310, a 5/17 son of MH 9367 Domino 2249 sold to Marc Feller, Redfield, Iowa, for $10,000. Lot 11, MH 4119 Advance 735, a 3/17 son of MH 2239 Advance 4119 sold to Curt Kralicek, Manning, North Dakota, for $9,500. Selling at $8,500 was lot 17, MH 4111 Trust 755, a 4/17 son of MH Trust 4111 to Milt Madison, Alexander, North Dakota. 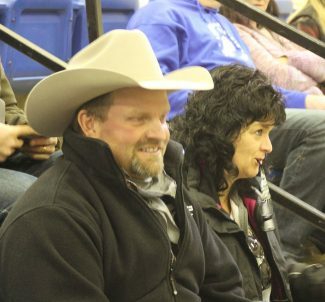 The horses in the sale were from Acord Quarter Horses, Weston, Wyoming. A very nice set of both younger and prime aged horses that have seen most every aspect of ranching. An excellent sale for the Mrnak Family.